Our analysis also finds differences in how much of their prime-time news coverage the three major cable news outlets devoted to the racially charged story centered around the police shooting of 18-year-old Michael Brown. MSNBC devoted far more time to the story than its top competitors Fox News and CNN. Fox News gave a total of about half the airtime that MSNBC did to events in Ferguson over the course of the first six days of the story, with CNN’s coverage in the middle.1 Our previous analysis of the 2012 killing of Trayvon Martin, another news story with strong racial undertones involving the shooting death of a black teen in Florida, found similar treatment by the three cable channels. Over the last few days, there have been a number of pieces reflecting on the role of Twitter in this story. This analysis helps shed light on its role, particularly in relation to the role of cable and network news. The story did indeed pop on Twitter before it did on cable. For those not turning to Twitter (only 19% of online U.S. adults use the social media site and about half get news there), network news was covering the story by Sunday evening, and two of the cable networks were by Monday evening (CNN did not give prime-time attention to the story until Tuesday – day three of the event). After day three, our analysis finds similar increases in volume, as the shooting death story became one about protests, police conduct and military-style tactics and eventually a federal response. Let’s take a closer look at the volume of tweets and television news coverage over the course of last week. The shooting occurred Saturday, Aug. 9. On both platforms, the story grew each day as it became a national news story. On Sunday, the day following Brown’s death, there were about 146,000 tweets posted on the subject. On Monday, both Fox News and MSNBC devoted time during their evening prime-time lineup, but CNN did not. By Tuesday night, all three cable channels devoted significant amounts of time to the story after two nights of protests had led to confrontations with police, and a friend of Michael Brown gave an interview claiming that Brown’s hands were in the air as he was shot – conflicting with the account offered by police officials. However, everything accelerated during the final hours of Wednesday night. Police wore riot gear and used tear gas during the fourth night of protests, and two reporters, Wesley Lowery of The Washington Post and Ryan Reilly of The Huffington Post, who were detained by police, tweeted about their experiences. The combination of these events on Wednesday spurred a dramatic increase in attention to the situation on Twitter. Between 8 p.m. and midnight EDT that evening, more than 1.1 million tweets were posted about Ferguson – an average of more than 4,500 tweets per minute. And while the cable channels were already paying attention, their focus intensified later that night and into the next day. By Thursday the events in Ferguson had become a story for national politicians to address. That day, President Obama commented on the events, and Missouri Gov. Jay Nixon arrived in Ferguson and turned over security operations in the town to the Missouri State Highway Patrol. Twitter conversation about Ferguson peaked, and all three cable networks devoted more than an hour of their prime-time news coverage to the story. 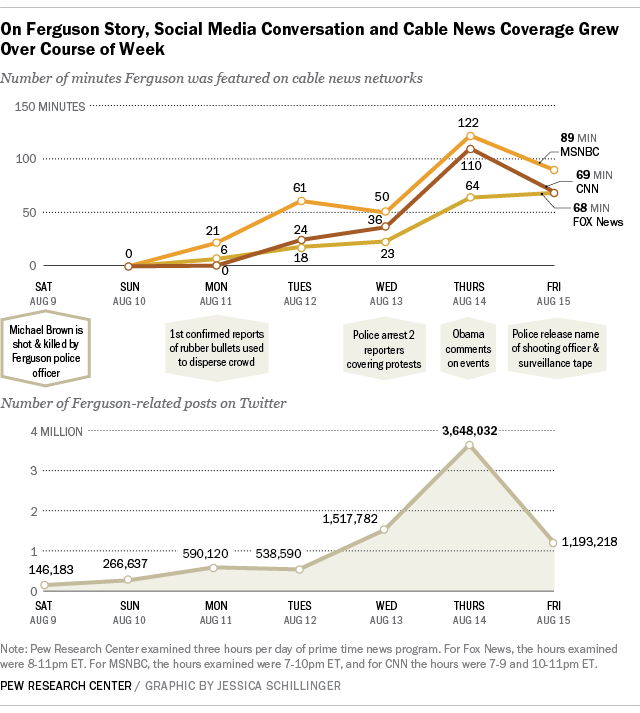 The three major cable news channels spent differing amounts of time on the Ferguson story. Of the 18 hours of prime-time programming examined from Sunday through Friday (3 hours per day), MSNBC devoted a total of 5 hours and 42 minutes to Ferguson, more than CNN’s 3 hours and 59 minutes, and almost twice as much as the nearly 3 hours Fox News spent on the story. However, Fox News increased its attention to the story and its coverage time was on par with CNN’s by Friday. The decision by Fox News to devote less time to the events in Ferguson than the other networks did was similar to how the channels covered the controversy surrounding Trayvon Martin’s shooting in March 2012. A Pew Research Center study of the coverage during the heart of that story showed that Fox News spent much less time (15% of its newshole) covering that controversy while MSNBC (49%) and CNN (40%) devoted far more attention. The two incidents – the deaths of Brown in Missouri and Martin in Florida – both involved a questionable shooting of an unarmed young black man and subsequent community outrage that was divided along racial lines, but they also involved different circumstances. Brown was killed by a city police officer, which has ignited simmering conflicts between the majority-black citizens and the majority-white police force. Trayvon Martin was killed in 2012 by community watch volunteer George Zimmerman, who reported Martin to police as a “suspicious person” after seeing him walking in a Florida neighborhood. The incident sparked a debate about racial profiling and the state’s “stand your ground” . The shootings of Michael Brown and Trayvon Martin also developed differently as news stories. It took nearly three weeks for Martin’s death to generate national headlines. His shooting received hardly any coverage when it occurred on February 26, 2012. But the release of the 911 tapes several weeks later created a jump in the volume of conversation on Twitter. In comparison, the events in Ferguson came to the nation’s attention much more quickly. Brown was killed on Saturday, August 9, and his death was covered by most national news outlets two days later. By the end of that week, Brown’s shooting and the subsequent protests and riots were the largest story in the country. 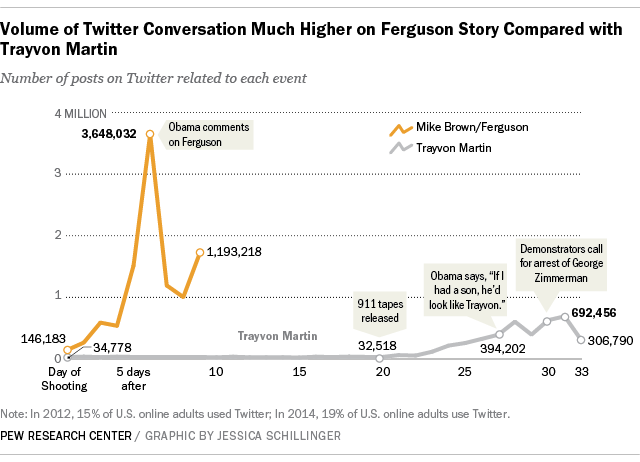 The Ferguson story also generated more activity on Twitter than the Martin story did. More than 10.6 million tweets were posted about Ferguson from the day the shooting occurred through the eight days that followed. (Of those, about 8.3 million used the hashtag #Ferguson, while 2.3 million additional tweets without that hashtag were identified by the computer learning algorithm Crimson Hexagon.) In comparison, the Martin story generated about 4.7 million tweets during the entire month following his shooting. The size of the Twitter audience has grown since 2012, when the Trayvon Martin shooting occurred. In 2012, 15% of U.S. online adults were on Twitter; today that figure has grown to 19%. Analysis of Twitter is meant to show how one subset of the population is discovering, reacting to and discussing the news, and is not meant to serve as a means to represent the national U.S. adult population.